For readers interested in other types of snakes common in the United States, please press the green snakes button. 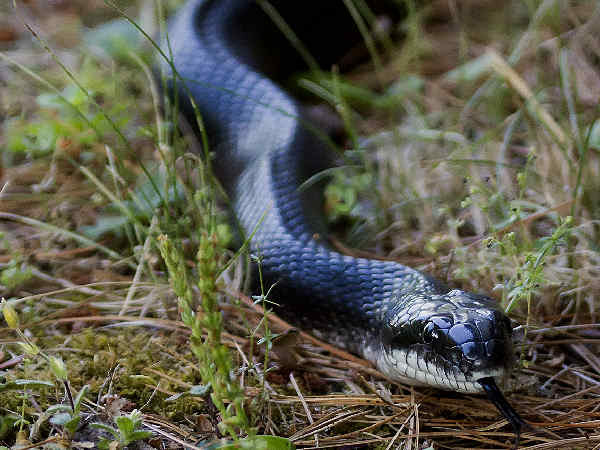 The Black Rat Snake ranks as the most wide ranging of the species. The all black body makes it a fairly easy species to recognize. 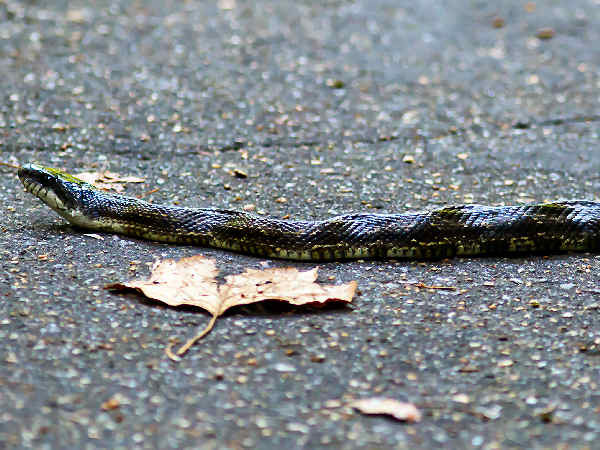 is the most widely distributed common rat snake with a range from New England south through Georgia and west across the northern parts of Alabama, Mississippi, and Louisiana, and north through Oklahoma to southern Wisconsin. There is also an isolated population in southern Canada and northern New York. Body color defines a few additional rat snakes. Adult Yellow Rat snakes, for example, have yellow to pale body color covered with four stripes. 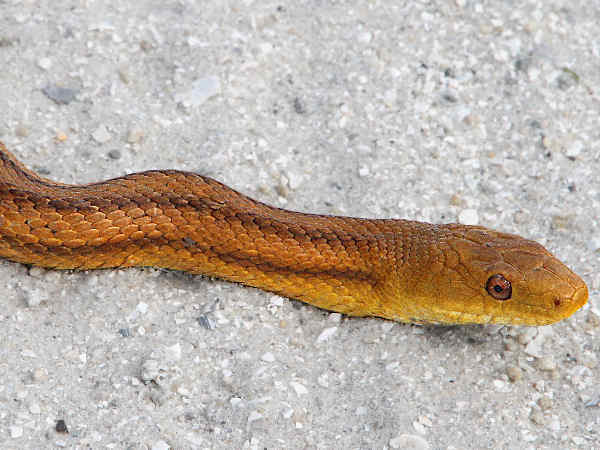 They inhabit areas along the Southeast coasts, including Florida. In Florida they are probably the most common of the rat snakes and well known as chicken snakes because they raid chicken coups for an easy meal. Gray Rat Snakes inhabit areas from southern Georgia and northern Florida west through Mississippi and north to southern Kentucky. Like other rat snakes, they grow to be very large, over six feet in length. The common name gray is really a very generic gray. They varies in color with some populations having light gray and others having dark gray bodies. Their bodies also have a pattern. In terms of size, because adults can grow so large, they become a very imposing snake for the average person to cross paths with. As a result of an encounter, many homeowners inquire into snake control measures when they see these large snakes. First and foremost, most large rat snakes are as afraid of people as people are afraid of them. In residential areas, they are basically only passing through. There is never a sufficient amount of rodents or other food sources for them. 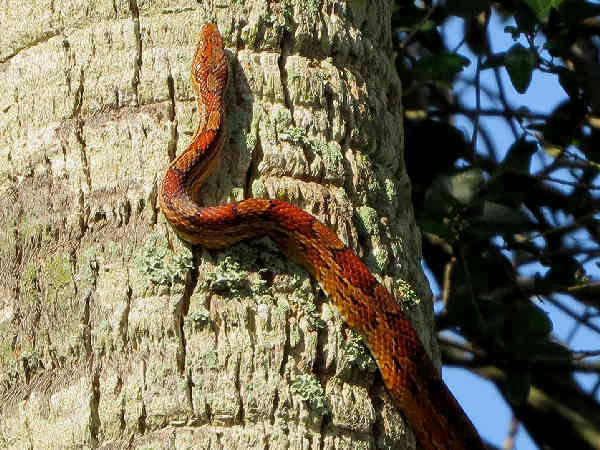 The corn snake (Pantherophis guttatus) inhabit a variety of forest areas from New Jersey south to Florida. However, they are most plentiful in the longleaf pine forests of the Southeast. 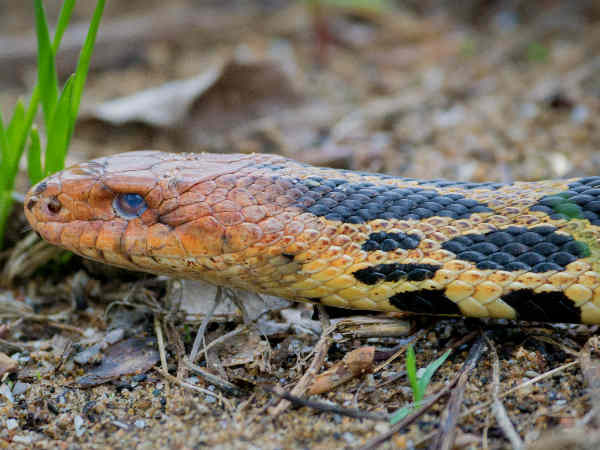 Two Fox Snake species inhabit areas of the Midwest, each with different habitat preferences. Western fox snakes prefer the drier areas around forests, prairies and pastures around the Midwest. Eastern Fox Snakes are fairly large snakes that can grow up to five feet in length. The inhabit the wetlands areas around the Great Lakes, and are recognized as very good swimmers. The have a pale or light color body covered with bold dark patches. The common name Fox refers to their odor. Both species rapidly vibrate their tail when they sense danger. In areas where their tails come up against brush, it could sound like a rattlesnake.